Rent your very own private speed boat from Vancouver Boat Rentals and start exploring the spectacular coastline of Vancouver. Looking to entertain friends or family? Vancouver boat rentals promises a fun filled adventure. With our easy access to Vancouvers coastline you will be out enjoying the waters in no time. Applicable taxes, fuel, and $10 insurance per driver are not included in our hourly rates. What age do I need to be to drive? The driver must be 21 years or older. What is required to rent a boat? A government ID and a $600 deposit by credit card or cash. Are there other costs involved in renting? Is a boating license required? Can my infant child come on the boat? Rent your very own private speed boat today. No boating license required. Vancouver Boat Rentals has the newest and best maintained boats in Vancouver. Why not do some bottom fishing ( $30 - 2 rods, tackle & bait ) or crabbing ( $10 ). The world renowned Dungeness crab fishing grounds are just minutes from our docks. Located in the heart of downtown Vancouver, Vancouver Boat Rentals has the best boat rental location for your exploration of the Vancouver coastline. Vancouver Boat Rentals makes it easy to rent a boat and start navigating the spectacular snow capped coastline of Downtown Vancouver, Howe Sound Islands and the Indian Arms Granite Waterfalls. Located in the heart of downtown Vancouver, Vancouver Boat Rentals has the best boat rental location to start exploring the Vancouver coastline. Vancouver Boat Rentals is located at the entrance to the world famous Granville Island. 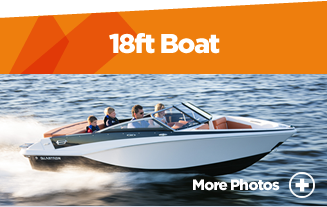 It has one of the largest speed boat rental fleets in Vancouver with boats ranging from the less powerful 16ft - 50hp Hourston Glasscrafts up to the faster and more exciting 18ft - 115hp Glastron GT boats. 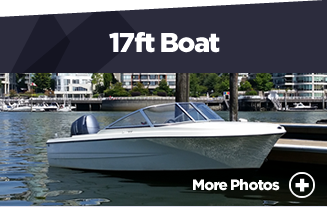 Vancouver Boat Rentals has a boat to meet your every boating need. Vancouver Boat Rentals makes it easy to rent a boat and start navigating the spectacular snow capped coastline of Downtown Vancouver, Howe Sound Islands and the Indian Arms Granite Waterfalls. You chose a day and time to rent a boat, then simply make an online reservation or drop by the office. We provide orientation for your trip, this is straightforward and only takes around 10-15 minutes. During this time you will be provided with a temporary boating certificate which is valid for your boat rental. You will be shown how to operate the boat and the safety equipment that is provided. Vancouver Boat Rentals provides life jackets for all passengers on the boat, including infants and youths. Our staff at Vancouver Boat Rental ensure you are comfortable operating the rental boat before you leave the dock. We are there to answer any questions you may have regarding operation, safety and navigation of the speed boat. Navigating your own path through Vancouver’s waters provides you with an experience like no other. Look up and catch sight of a bald eagle, look down and see the harbour seals at play. What better and more exhilarating way to spend a day in Vancouver than exploring it from the water.There is no skyline just quite like it, from the snow capped peaks of the North Shore, Indian Arm mountains to the downtown skyscrapers. Vancouver Boat Rentals ensures you have a clean and well maintained boat for your boating adventure. Vancouver Boat Rentals average boat rental duration is between 2-3 hours. In this time you can venture East to the spectacular Granite Waterfalls or West to the seal colony in the Howe Sound. Both trips East and West are amazing and both offer different views and experiences. If venturing east to the Granite waterfalls here is what you can expect. You will start your Vancouver Boat Rental experience from the heart of Vancouver, on Granville Island.